From an early age, Sharon Stewart knew that she'd be a writer. Before she pursued her career as an author, however, she travelled to such places as China and Spain. She also worked as an editor. 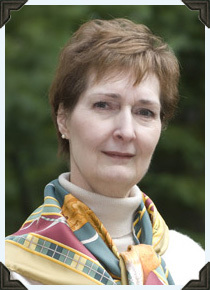 Her books have earned her many honours: The Dark Tower (now titled The Princess in the Tower) was shortlisted for both the Red Cedar Award and the Geoffrey Bilson Award for Historical Fiction, and My Anastasia (now The Last Duchess), a story about the youngest daughter of Russia's last tsar, was shortlisted for the Red Cedar Award. Her book Raven Quest, which earned her several award nominations including the Manitoba Young Readers' Choice Award, won the Silver Birch Award in 2004. Since then Sharon has written several more books in addition to Banished from Our Home: Wolf Rider, Louis Riel: Firebrand, and most recently Phoenix: The Life of Norman Bethune (with Roderick Stewart). Check out Sharon Stewart's other books. Can it really be ten years since the beginning of the Dear Canada series? I was thrilled to be asked to be a part of such an important project, and still am. It's wonderful to know that Banished from Our Home keeps company with so many fine books by distinguished Canadian authors — stories that present the history of our country with such depth and insight.